Polish composer Krystof Penderecki [pronounced Pen-der-ET-skee] returns to Montreal on April 8 to conduct the North American premiere of the complete version (including the recently composed Sanctus) of his massive Polish Requiem. Who better to lead the Montreal Symphony Orchestra and Chorus than the composer himself, who has conducted over 100 performances of his Requiem around the world? La Scena Musicale spoke with Maestro Penderecki about the Polish Requiem last October in New York. We met in the Oak Room of the Plaza Hotel where the Maestro was staying with his wife. At 65, Krystof Penderecki looks every inch the well-tailored Mitteleuropean cultural icon, with heavily accented speech, white goatee, and an owlish professorial gaze. He is a charming and well-practiced interviewee, kindly answering questions he has probably heard a hundred times before. Penderecki explains that the Polish Requiem was written in stages over a period of several years, like all of his large compositions. "That is my method. I always seek the form first. That is the most important thing. Then I sketch in details, themes, motifs and development. You can see the complete form better this way than if you start at the beginning and write through to the end." Penderecki has no problem maintaining the creative impulse over months and years. On the contrary, he finds that his compositions "crystallize" over time. The Polish Requiem, which Penderecki dedicated to his country's sufferings, grew from a number of originally unrelated occasional pieces and commissions. It began back in 1980 when Solidarity leader Lech Walesa commissioned a piece for the unveiling of a monument to the victims of the Gdansk uprising. Penderecki recalls, "Just one month before the unveiling I still had not found the right text to inspire me. I was conducting in Baden-Baden when I came across a score of Verdi's Requiem. The Lacrimosa seemed the perfect text and I wrote it in one month." Was he influenced by Verdi's music? "Of course not!" In 1981 Penderecki's friend Cardinal Wyszynski died. "I got the news in the morning and I wrote the Agnus Dei by that afternoon." The Dies irae was commissioned in 1984 to commemorate the Polish resistance to Nazism. And so Penderecki's unorthodox mass for the dead came into being. He even incorporated an old Polish hymn tune in the Recordare, Jesu pie, while omitting parts of the Offertorium and adding a big Finale: Libera Animus recapitulating all the themes. The optimistic Finale promises an end to Poland's suffering. "Those were troubled times, times of change, but we felt that things had to get better," the composer recalls. The complete Polish Requiem (1984 version) was premiered by Mstislav Rostropovich in Stuttgart on September 28, 1984, and recorded for Deutsche Grammophon. For the 1993 Penderecki Festival in Stockholm on the composer�s 50th birthday he wrote a new Sanctus. The 1995 Chandos recording of the complete 1993 Requiem remains definitive. 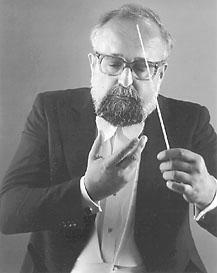 Though born a Roman Catholic, Penderecki wouldn't call his Requiem religious music. "In the past I have used Hebrew and Russian Orthodox Church music but my main inspiration is the solid German 19th century symphonic tradition and Renaissance polyphony." Despite the historical and patriotic significance of the Polish Requiem, Penderecki denies it is a political piece. "I don't write political music. Political music is immediately obsolete. My Threnody for the Victims of Hiroshima remains important because it is abstract music. The Requiem is dedicated to certain people and events, but the music has a broader significance." Stylistically the Polish Requiem bears little relation to Penderecki's wild years of innovation in the 1960s. "My Threnody is still avantgarde, but the age of experimentation is over. We discovered everything!" The Requiem reflects Penderecki's new pluralism. Audiences will hear passages of pure tonality as well as noisy sound clusters and polyphonic atonal chromaticism. The score calls for a big orchestra with quadrupled winds, six horns, heavy percussion, mixed chorus and four soloists. Penderecki will bring several eastern European soloists who have sung the Requiem before. MSO Choirmaster Iwan Edwards, who has never conducted a work by Penderecki, calls the Requiem one of the most difficult pieces his choir has ever tackled. "Technically it is very challenging because of the dissonances, the division of voices and the rhythm. When the choir members first saw the score they were a bit unhappy but now they are coming to appreciate it. The Requiem is frighteningly expressive and emotional but also melodic and accessible." Penderecki is confident that the Montreal Symphony Orchestra and Choir are up to the challenge: "I can only perform my Requiem with a really excellent orchestra and chorus. From my previous conducting experience in Montreal I know they are perfectly capable." Penderecki conducts the Polish Requiem with the Montreal Symphony Orchestra and Choir, April 8, 1998, at 19h30 at Notre Dame Basilica ($10,$20,$36). Ticket information: 842-9951. During the week before this concert, a Polish Music Festival will be held at the Polish Consulate, 1500 Pine Ave. West, April 2-5. Concerts on April 3,4,5, with the April 5 performance being graced by the presence of Penderecki himself. Ticket information at 487-5550.